A one-sixth scale model of RELIANCE is huge – our boom, for example is a foot longer than an S-Boat boom! Yet visitors have seen “big boats” such as BELISARIUS in the Hall of Boats, America3 on the lawn, and even our TRIVIA in building 28 and somehow equate them to a grown-up RELIANCE. Those who know of the J-Boats often think of RELIANCE as a J-Boat. 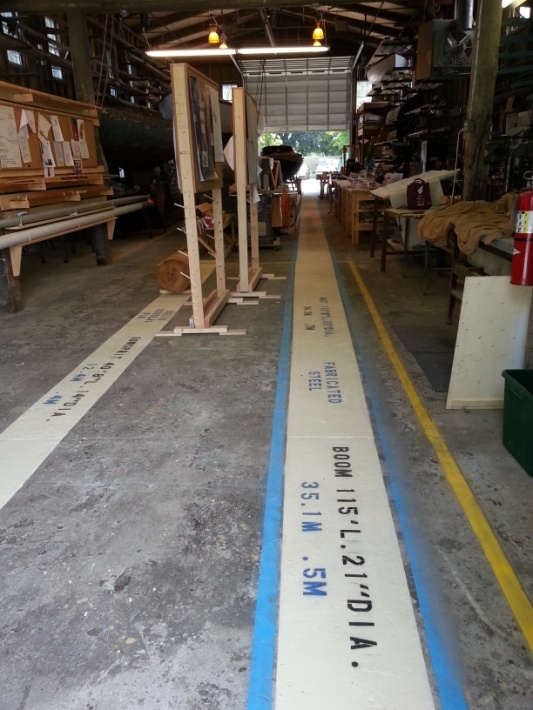 So, the first thing visitors see when they come in our door is the outline of the real 115’ long boom, 112’ tall mast, and 40’ 7 1/2 “ long bowsprit on the floor. 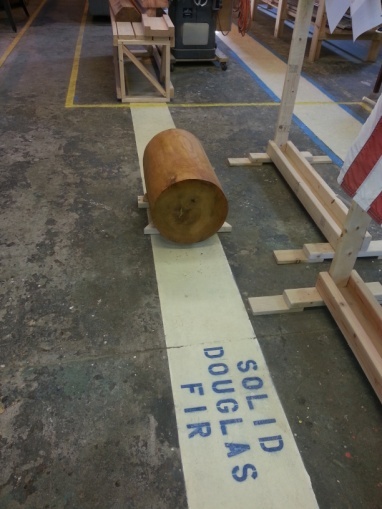 We’ve also placed a 2’ x 14 3/8” diameter solid wood bowsprit section on the bowsprit outline. 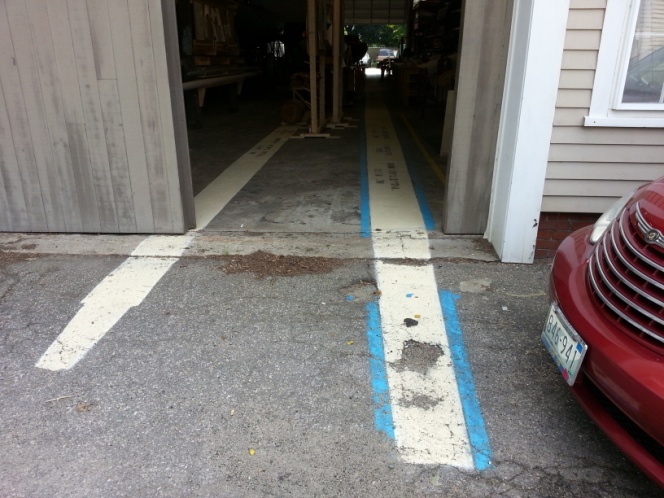 These usually get a “holy smoke” – like comment! Finally, we are making 4’ sections of the wooden hollow spars. 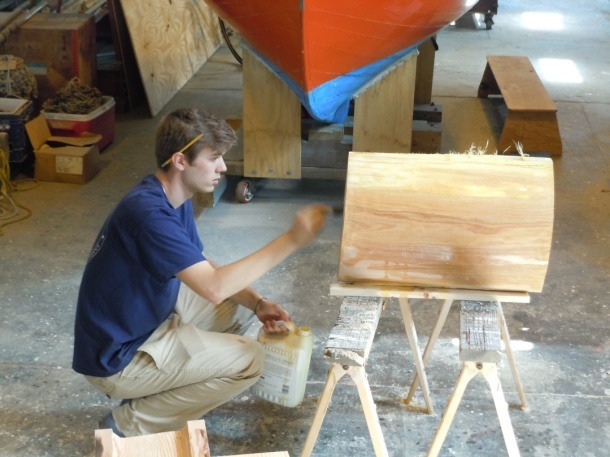 Our intern Aaron Towers has been instrumental in fashioning the bowsprit section. All that is left when the weather cools off and gets dryer is to varnish it and build a display cradle. We’ve placed the inboard end of the bowsprit outline under our scale bowsprit so visitors can see up-close the impact of scale. This entry was posted in Project Manager's Welcome and tagged America's Cup, belisarius, Herreshoff, j boat, RELIANCE on October 1, 2013 by Herreshoff Marine Museum/America's Cup Hall of Fame.